Convert a standard parallel printer into a shared network printer over a 10/100 Ethernet network. The PM1115P2 Ethernet to Parallel Network Print Server lets you convert a standard parallel printer into a shared network printer over a 10/100Mbps network. 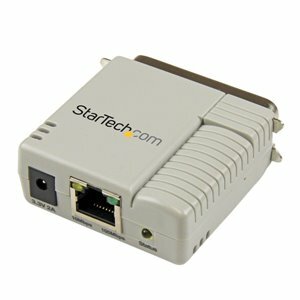 Providing network printing access allows you to share a single printer among multiple network connected computers, while also avoiding the added costs and inconveniences of purchasing printers for each workstation or area.This compact, lightweight Ethernet print server connects directly to the Centronics port on your printer, for a discreet solution that doesn't require a cable between your printer and the device - simply connect the device to the network using an RJ45 cable. The ability to position your printer anywhere on the network does away with the need for a dedicated print server PC, saving resources and avoiding performance bottlenecks.The parallel print server can have you up and running in minutes, using either a remote web-based or Windows based installation wizard. The print server offers broad operating system compatibility and works with a wide variety of parallel printing devices for easy installation into mixed environments, and also supports Simple Network Management Protocol (SNMP) for remote monitoring. The PM1115P2 Ethernet to Parallel Network Print Server lets you convert a standard parallel printer into a shared network printer over a 10/100Mbps network. Providing network printing access allows you to share a single printer among multiple network connected computers, while also avoiding the added costs and inconveniences of purchasing printers for each workstation or area.This compact, lightweight Ethernet print server connects directly to the Centronics port on your printer, for a discreet solution that doesn’t require a cable between your printer and the device - simply connect the device to the network using an RJ45 cable. The ability to position your printer anywhere on the network does away with the need for a dedicated print server PC, saving resources and avoiding performance bottlenecks. The parallel print server can have you up and running in minutes, using either a remote web-based or Windows® based installation wizard. The print server offers broad operating system compatibility and works with a wide variety of parallel printing devices for easy installation into mixed environments, and also supports Simple Network Management Protocol (SNMP) for remote monitoring.